For our first color watch, we are going to jump on the new year bandwagon and discuss Pantone’s 2019 Color of the Year: Living Coral 16-1546. Named after the vibrant underwater sea flora, this color emphasizes the same striking tranquility as its namesake. Pantone describes it as a “life-affirming” color that “energizes and enlivens with a softer edge.” Below are a few keepsakes that use shades of coral and how we incorporated them to accentuate our pieces. With our first example we go to the beach; what better place to look at our underwater inspiration! The sunset that backs the photograph of the happy couple perfectly matches the living coral found in the peonies, ginger and lilies. Darker and more faded shades of pink have a crescendo effect on the arrangement, while the ferns and air plant bring in some vitality. Finally, the lily and campanula that tie in the clean beveled white frame and the neutral willow faille background lining are bright and reminiscent of sand and shells, bringing the work full circle to the beach setting captured in the picture. A more traditional bouquet resemblance for our second example captures the redder tones found in living coral with the hypericum berries and roses. The white roses in the bouquet reference the white lisianthus, while the matching shades of red and coral found in the wedding invitation and the groom’s ranunculus boutonniere bring the attention back to the main bouquet. The beautiful white ribbon-wrapped handle, candlelight moire faille lining and popular imperial gold frame are simple yet elegant and with the personalized wedding invitation and wire monogram cake topper, this keepsake is sure to hold memories that will last a lifetime. 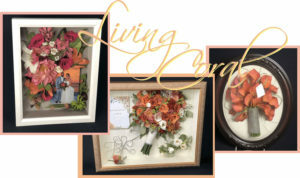 Our last example is a bouquet of living coral callas and bear grass showcase the glamorous side of the bride. This oval keepsake contains a pop of glam with the rhinestone silver handle, but stays grounded with a simple candlelight faille fabric lining and contrasting cherry brocade frame. Our administrative office is open Monday-Thursday: 9am-3pm EST and Friday: 9am-Noon EST. The office is closed most major holidays. Please call prior to dropping off or picking up floral arrangements.